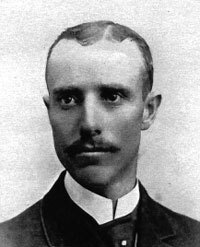 Elmer Brigham Leavitt was born on February 19, 1859 in Council Bluff, Iowa and is the son of John Quincy Leavitt and Malinda Minnion. He came west with his family and lived first in Ogden, Utah and as a small child moved to Farmington, Utah. He launched his career as a youth of 18 as a railroad telegraph operator on the old Utah Central Line now the Union Pacific. Later he and his brother, Julian, ran a machine shop in Ogden, Utah, and operated the railroad line to the hot springs near the city. He finally gave up this project and returned to the Utah Central as an office employee and later handled important engineering details of the beautiful Salt Lake City Union Pacific station. He married Mary Ellen Spitzer, his first wife, on the 9th of January, 1880. She was known as Aunt Molly to the family. His second wife was Mary Ellen's sister, Estella, known as Stella. Aunt Molly wanted to go to California because her family was there. She and Elmer had no children. She finally got so persistant about going to California she packed her clothes and left Uncle El. He felt so bad that he came to Ida, his sister, and asked what he should do. She said "If you want her go after her", and he did. He got a fine job in San Francisco with the Southern Pacific Railroad in 1911. He became lease and right-of-way buyer for Southern Pacific, a post he held under six presidents of the road, retiring in 1931 while Paul Shoup of Los Altos was president. On his retirement he moved to San Jose and spent his remaining days making motor trips and visiting friends throughout the state. He died May 12, 1936 in San Jose, California. He was buried in Oak Hills Memorial Park.